Students and postdocs may apply for limited funding in the form of a registration fee. Various spaces at Snowbird's Cliff Lodge. Click the links below to register ONLY for the Social Events. For a more detailed program, click the "Program" button above, or click here. For the presentation abstracts, click the "Abstracts" button above, or click here. 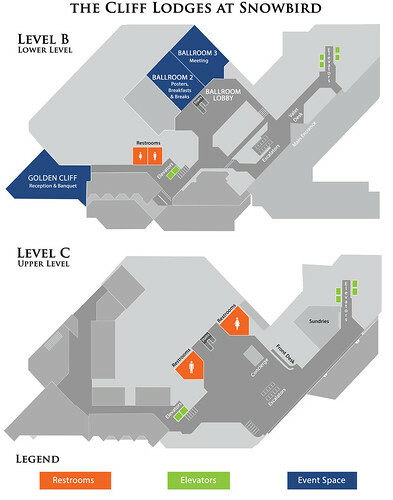 The oral presentations and moderated discussions will take place in Ballroom 3 (see map below). Breakfasts, all breaks, and posters will take place in Ballroom 2. The social events (the Opening Reception, and the Banquet) will take place in the Golden Cliff Ballroom. More information will be posted shortly, but in the meantime, we have included some general information below. Please set up for your talk during the break prior to your time slot. A laser pointer/clicker will be available for use. Please prepare a "scrubbed" (public) PDF version of your talk to be posted online after the conference. Q: What are the rough start/ending times of the meeting? A: Nothing is set in stone at this point in time. Q: Do I pay for the banquet separately? A: Yes, you can pay separately at any time before March 15th, and you can pay for additional people as well. The registration website will give you an option to create a new badge for each person you wish to bring along. Q: Are there discounted lift tickets? Half day (from 12:30-4:30pm): $98. **Must show conference badge to the ticket office.